I am the “Nifty Knitter”, also known as Lisa Hannan Fox. 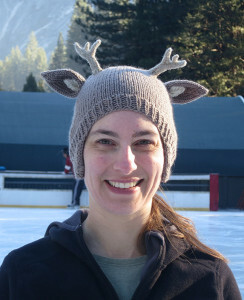 I’m a Software Engineer from Northern California, and in addition to knitting, I also cross stitch, crochet, and occasionally sew. When I’m not crafting, I enjoy hiking, backpacking, figure skating, and playing video games. I started knitting in the beginning of 2011. I had crocheted when I was a kid and cross stitched most of my life and was ready for something new, so I asked my mom to teach me to knit. She taught me the basics — cast on, cast off, knit, and purl. After a little practice, I immediately launched into my first project, a 2×2 forest green ribbed scarf. I took to it quickly and the scarf came out great, thus starting my addiction. I started devouring knitting projects, one after another, and soon started designing my very first project, a giant tetris afghan. After working on it off and on for five years, I finally finished it and published the pattern, along with other patterns I designed in the meantime. I am always looking for new knitting techniques and new types of projects to complete. I love the challenge, and I love being able to sit and make something useful with my hands from nothing more than yarn and some tools. Plus, if there is ever a zombie apocalypse, I’m well equipped to make socks, sweaters and blankets for everyone! Contact me! I’d love to hear about your own knitting experiences, feedback for my patterns, or anything else you’d like to comment on. Make sure to enter your email address if you would like a reply.